Coriolanus: Why did T.S. Eliot love it so much? A closer look at T.S. Eliot’s zany claim. In 1919, T.S. Eliot published an essay that elevates literary contrarianism to heights that have rarely been equaled. The central argument of “Hamlet and His Problems,” which first appeared in the Athenaeum and was later collected in The Sacred Wood, is that Hamlet, considered a masterpiece for centuries, is a shambles. Eliot goes on to insist that the Bard’s greatest tragedy is actually a play few peopled paid much attention to then or now: Coriolanus, just adapted for the screen by Ralph Fiennes. To dismiss Hamlet, Eliot must rebut most of the critics who have come before him. But he pays special attention to two fellow poet-critics, Goethe and Coleridge. Those two, he says, used their creative gifts to imagine a Hamlet who doesn’t really exist in the play. Goethe, Eliot says, “made of Hamlet a Werther,” i.e., a similarly Romantic soul not adequate to his times. And Coleridge “made of Hamlet a Coleridge,” a man who, in Coleridge’s words, suffers from “an overbalance in the contemplative faculty,” and thus “loses his natural power of action.” These attempts to decipher the character founder, according to Eliot, on the play’s fundamental disjointedness: Laying out in detail Shakespeare’s indebtedness to Thomas Kyd’s Spanish Tragedy, he argues that Hamlet is not a coherent work of art by one author, but a never-quite-finished hodge-podge, with a borrowed plot and superimposed set of motivations that don’t quite make sense. Coriolanus may be not as “interesting” as Hamlet, but it is, with Antony and Cleopatra, Shakespeare’s most assured artistic success. And probably more people have thought Hamlet a work of art because they found it interesting, than have found it interesting because it is a work of art. It is the Mona Lisa of literature. Basically, Eliot thought Coriolanus was better because it made sense. And it still does: As Dana Stevens writes in her review of the new film for Slate, Fiennes (and his screenwriter John Logan) have crafted out of Shakespeare’s drama “a tightly plotted action thriller. In point of fact,” she adds, “Coriolanus was already a tightly plotted action thriller.” And she’s right: Unlike the rambling, digressive Hamlet (with its “superfluous and inconsistent scenes which even hasty revision should have noticed,” as Eliot puts it—remember the pirates? ), Coriolanus tells its simpler story with an appealing brevity (warning: 500-year-old spoilers ahead): The title character, a Roman general, after defeating a rebellious army, is pushed to run for consul. His contempt for the common people, however, leads instead to his exile—at which point he teams up with the leader of the rebellious army he previously defeated—a man named Aufidius—and attacks Rome. There his mother persuades him to establish peace instead. Which he does, only to be murdered by Aufidius for this betrayal. Of course, he’s done no such thing— Žižek is just trying to ride Eliot’s anti-conventional-wisdom coattails. 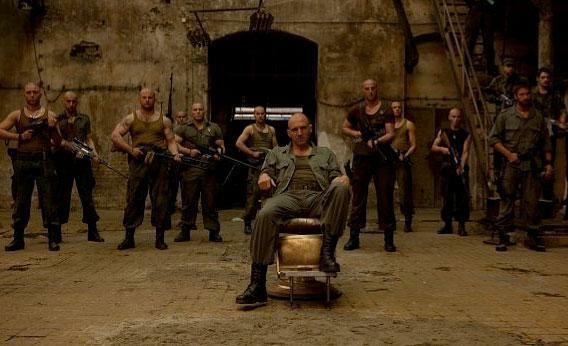 (Žižek actually spends most of his piece on Coriolanus expounding another contrarian interpretation, of the sword-and-sandals movie 300, on the flimsy pretext that Gerard Butler is in that, too.) Indeed, Žižek undercuts himself with the very first sentence of his essay, writing that “the way to test a great work of art is to ask how it survives decontextualization, transposition into a new context.” By that measure, Hamlet, performed countless times around the world in every possible setting, is far more proven than Coriolanus. Eliot’s notion that Coriolanus is better than Hamlet because it makes more sense is, if anything, even more dubious. Do our moods and emotions always have “adequate equivalent[s]”? Of course not. This is precisely the genius of Hamlet, that it so compellingly portrays a mind at odds with its surroundings, mysterious to itself as well as to us. The near century that has passed since Eliot’s essay has only provided more evidence of the wrongness of his judgment, Fiennes’ fine movie notwithstanding. Of course, that century has also demonstrated the value of contrarianism for a critic who wishes to stand out: Eliot’s argument continues to fly so fully in the face of conventional wisdom that, to this day, his semi-offhand comment about Coriolanus may be the most famous thing about the play. You’ll even find it mentioned in the review of the new Fiennes adaptation published by the AP—a news outlet that is not generally in the habit of citing 90-year-old works of literary criticism in its film reviews. So, well done, Mr. Eliot. I guess.